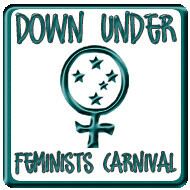 Home › Sociology › gender & feminism › The Eleventh Down Under Feminists Carnival is up at Why I’m Bitter! The Eleventh Down Under Feminists Carnival is up at Why I’m Bitter! The Eleventh Down Under Feminists Carnival is up at Why I’m Bitter’s Weblog. Yay! If you’re a regular reader, or especially if you’re featured in the carnival, please place a link to it and spread the word. You’re welcome to use the logo at top and to hotlink to it; please also make the logo link to the main Carnival page. The twelfth edition of the Down Under Feminists Carnival will be held at Zero at the Bone in the first week of May – our BIG BIRTHDAY CARNIVAL! So start writing and submitting, and/or nominating the posts you’re reading. All posts by an Australian or New Zealand feminist published in April are eligible. If you can’t access the captcha at Blogcarnival, email your submissions to chally.zeroatthebone at gmail dot com . The deadline for submissions has been tweaked: it’s two days after the end of the month, so you have a bit of a grace period to sort through the posts you’d like to submit. The actual posts submitted must still fall within the month featured. The Carnival information and guidelines are here. Submit posts here at Blogcarnival. And we need more hosts! The spots for the next few carnivals are taken (Thankyou, volunteers). But the August carnival and thereafter are still open – and if you don’t grab them, I’ll have to do it. Please drop me a line via our blog contact form, or email me at gmail (username lauredhelhoyden), if you’d like to host a carnival. You’ve accidentally linked to #10. Every time I get something wrong. It’s like a Law or something.